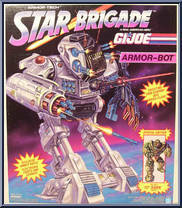 Among Cobra's vast array of specialized infantry troopers, the only ones qualified-besides Cobra T.A.R.G.A.T. 's-for duty in the dangerous voids of space are the ASTRO-VIPERS. They are the only soldier. . . It has been predicted that the battles of tomorrow would be fought in the cosmic realm of space. Today that theory has become reality as G. I. Joe fights to protect Earth-and the universe-from Cobra's. 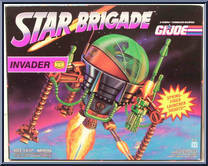 . .
OZONE is the Star Brigade's specialist in atmospheric dispersal toxins. He's an expert at neutralizing various forms of airborne sludge and other harmful chemicals while replenishing the ozone layer a. . . Payload grew up watching the early space shots blasting off through the Florida sky. He often stared through a hole in the space center's security fence and rode the flaming booster rockets in his dre. . .
What can you say about a guy who totes a 134-pound machine gun as his personal weapon, and who can whip up the meanest freeze-dried crawdad stew this side of the Milky Way? Not much. You just stay out. . . 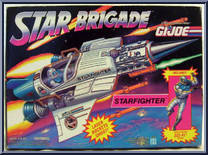 These terror troopers are deployed into orbit from Cobra Invaders wearing specialized, self-contained space suits. The suits contain ceramic composite heat shielding armor that provides coolant safety. . .